Earlier this month, Kroger unrolled groundbreaking technology from Microsoft that could set a new standard for in-store grocery shopping. Such things might sound like something out of Harry Potter, but they're becoming a reality for some Americans. Grocers are taking creative steps to adapt to the rise in online shopping, by inventing new ways to attract customers. Analysts agree that despite the rise in e-grocery, shoppers still want the option to shop brick-and-mortar. They want convenience, speed, and a seamless shopping experience; an interplay between online and in-store shopping. Customers might opt to have some groceries delivered, while they run to the store for others. They might click-and-collect one week, then shop in-person the next. Above all, customers want choice. But while grocery stores aren't going anywhere any time soon, that doesn't mean they don't have to adapt to the changing landscape. So what are the ways grocers are adapting? The "Superbarket" or the "Grocerbar." Some grocers now sell alcohol by the glass in an effort to persuade customers to come in and stay longer (and of course, buy more). 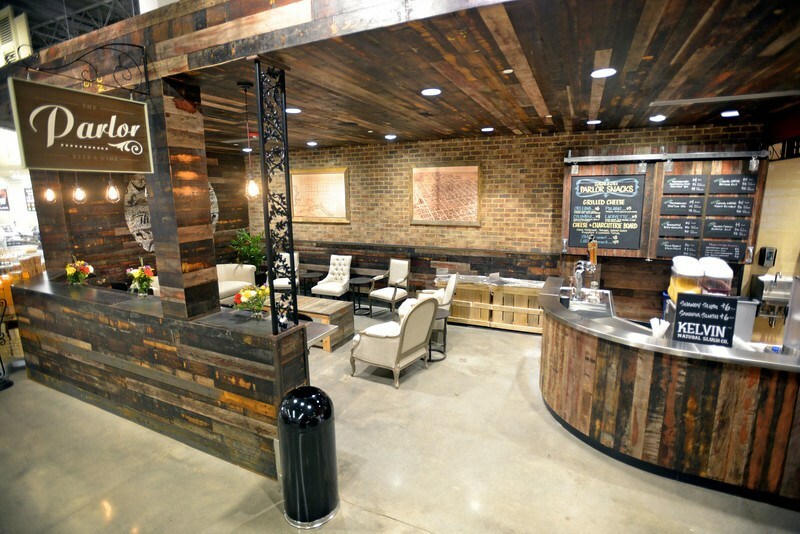 At a Whole Foods in Savannah, Georgia, you can hang out in "The Parlor" and drink local beers on-tap. Some of Pittsburgh-based Giant Eagle's Market District stores offer hor d'oeurvres, wine, and a three-piece band on Fridays. Other grocers are trying out "fun add-ons like wine tastings, cooking demos, coffee shops or even restaurants" (Food Network), making grocery shopping not a chore, but a destination – or at least a more enjoyable, social experience. Grocerants: blurring the line between retail and dining. According to Technomic Inc., a research and consulting firm, more consumers are choosing their local grocery store when dining out, over traditional fast food and restaurants. In fact, in 2016 grocerants generated 2.4 billion visits and $10 billion in sales by promoting in-house freshly prepared foods. Designed with the intent to encourage customers to linger, grocers like Wegmans and Whole Foods are trying to make their stores feel like “experiential food destinations rather than mere shopping markets” (Eater). As eGrocery expands and Millennials continue to demand convenience as well as options, these ‘grocerants’ have the capacity to tap into meal planning by putting their recipes online and allowing their customers to shop the meals they ate in-store. Capitalizing on a small, specialized selection. Contrary to what you might expect, given that one-stop-shop giants like Amazon and Walmart currently dominate the market, customers have a soft spot for specialized stores, and they're willing to shop around – both digitally and in person – to get the specific products they want. The consumer market research firm Magid reported that as of 2017, 50% of customers shop at three or more grocery stores, "including roughly one in six who shop at five different stores" (NBC News). Micro-markets at unorthodox locations. Another way size factors into the changing grocery landscape is the "store-within-a-store" or a "micro-market" – that is, when one business offers its products on another company's shelves. Since August 2018, Pennsylvania grocer The Butcher Shoppe has sold its "snacks, grab-and-go foods and beverages" inside a nearby hospital, which has resulted in three times more sales than projected. Through this method, grocers not only get their products in front of more customers, they can also save money on building new stores, while still expanding. According to GroceryDive, the West Coast-based Green Zebra Grocery offers its goods in offices and work spaces, in part because it would cost around $1.5 million to build a new store "while a micro Zebra — which only requires some shelving and a refrigeration unit — costs just $7,500." Offering meal-kits in-stores. Meal kits are a $2.2 billion industry, and that number is expected to rise 25-30% in the next five years, so it makes sense that grocers are getting in on the buzz. Blue Apron kits are now available in over 60 Costco stores. Plated kits are available in Safeway and Albertsons stores. HelloFresh kits are sold at Giant Food and Stop & Shop stores. And the list goes on. Changes in payment technology. The recent Kroger/Microsoft partnership isn't the first to digitize purchasing in stores. In 2018, Kroger began offering its "Bag, Scan, Go" service in 400 stores, where shoppers use a handheld device to scan items' bar codes. Walmart began offering a similar service in six states in 2017, allowing shoppers to use an app to scan their items. Perhaps the most futuristic version of this trend so far is the cashier-less Amazon GO stores in Chicago, Seattle, and San Francisco, where you simply walk out with your purchases; a turnstile senses the items you're carrying and automatically bills your credit card. We can expect to see more developments like these; according to Forbes, industry expert John Karolefski predicts "a rapid expansion in grocers that accept Apple Pay and other mobile payments." Grocers today are in the midst of a changing landscape. While some may have feared that online shopping would signal the end of brick-and-mortar stores, trends show that that's not the case – grocery stores are still in high demand. That said, grocers do need to offer customers a seamless omnichannel experience in order to compete, and that means providing innovative, user-friendly services in-store and industry-leading software across all mobile devices, such as search optimization, content management, meal planning, and segment-of-one personalization. To learn how locai can partner with your grocery business to provide top-of-the-line omnichannel engagement, contact us here.